that's what we strive to do here at the Armstrong Flower & Gift Shoppe. We have been serving the Armstong/Spallumcheen, Enderby and surrounding areas for over 35 years. We pride ourselves in our determination to create and convey your message as accurately and beautifully as possible. Our shop is open from 8:30 a.m. to 5:30 p.m., Monday through Saturday and from 10:00 a.m. to 4:00 p.m. on Sundays. We are closed on Stats & Holidays. To help assure on-time delivery during the busy holiday season, place your order at least 1 week prior to the following major holidays: Thanksgiving Day, Christmas Day, New Year's Day, Valentine's Day, Easter, Administrative Professionals Week, Mother's Day, Victoria Day, Father's Day, Canada Day and Labour Day. Our shop will always be closed on the following holidays: Thanksgiving Day, Christmas Day, Boxing Day, New Year's Day, Family Day, Easter, Victoria Day, Father's Day, Canada Day, Labor Day and Remembrance Day. We will be closed December 25th to January 1st to enjoy time off with our family and friends. 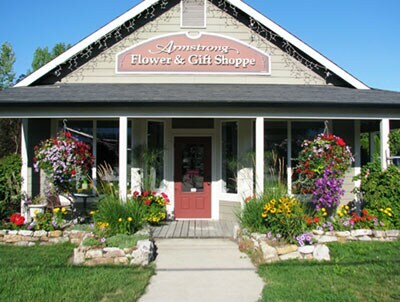 Our shop serves the following areas in British Columbia: Armstrong, Spallumcheen, Enderby and surrounding areas. If you have any questions or need more information, please contact by email or phone. We're always here to serve you and make your flower-sending experience a pleasure.